Incapable. Awkward. Artless. That’s what the other girls whisper behind her back. But sixteen-year-old Adelice Lewys has a secret: She wants to fail. #1“Cormac and I have an understanding." Erik raises an eyebrow. Clearly he's got the wrong idea. #2 "He's a bit of a charmer," Enora warns. I rol my eyes. "I couldn't tell." "It's none of my business, but...Oh, never mind." She leans in and tugs at my fitted jacket. "We have more important things to worry about." "Have we run out of mascara?" I ask in mock horror. When I instagrammed a picture of a haul of books I bought last weekend, so many of you guys told me to read Crewel! I have been looking at this one for a while now and have been meaning to read it, but after hearing everyone rave about it, I knew now was the time. After just having finished it, I can say that although Crewel was a very unique and intriguing dystopian novel, I can't say I absolutely love it as much as others do. It's a creative storyline but something just wasn't clicking for me. It took me about four days to read Crewel and typically, I take only two days to read a good book (one if it's flipping amazing)! 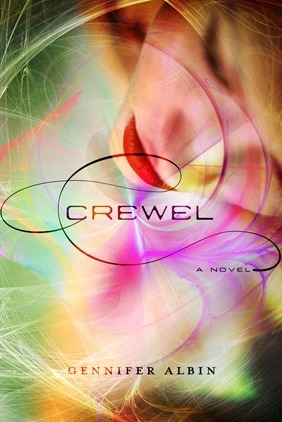 I'm not exactly sure why Crewel had a hard time holding my attention seeing as the actual plot and world that Gennifer Albin creates in Crewel can only be described with the word creativity, but nonetheless I had trouble staying focused. I think a large part of this had to do with the high expectation I went into Crewel with that I just kept waiting for that "aha" moment where I would understand all the hype, but unfortunately I just never got it. The main character, Adelice, was thankfully a character I was able to enjoy. I admired the fact that she is able to hold herself together during times it would be more than difficult to do so, and she had a bit of wit to her that provided some comedy into the storyline. Probably one of the biggest flops about this book is the love triangle. I'm not someone completely opposed to love triangles, but this one in Crewel wasn't doing it for me. Adelice shares intimate moments with both Jost and Erik (although it's clear, Jost is the main focus), but I feel like I haven't seen anything from either guy that makes me go, "OHHHH SHE HAS TO CHOOSE THAT ONE OR MY LIFE WILL END!" That being said, a certain kind-of-surprising-kind-of-not revelation about these two boys is revealed at then end of Crewel that I'm curious to see how it effects the plot in book two. Overall, Crewel was a unique dystopian read that I'd recommend to those looking for something really different. I definitely liked it but I just don't think it held up to its hype and my high expectations. Have you read Crewel? Are you excited for the release of book two, Altered, on October 29th? Be sure to let me know in the comments below! Keep Reading!